PSX Spyro 2: Ripto's Rage! (USA) in 07:32.47 by lapogne36 & Crash41596. 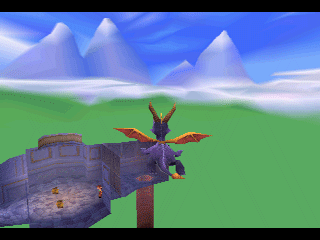 In true platformer-sequel style, Spyro the Dragon's vacation is interrupted by a dinosaur-riding sorcerer by the name of Ripto invading the world of Avalar, who naturally needs to be stopped. Since vacation is the paramount concern of Spyro, this is naturally done as quickly as possible without any concern for the well-being of Avalar. While the other movie of Spyro 2 mainly follows the route intended by the developers, this run by lapogne36 and Crash41596 invents its own path, cutting in and out of the game world at will and completing only the bare minimum needed to reach the final battle.